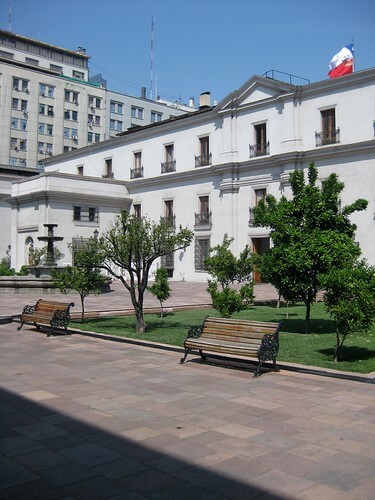 The Chilean Presidential Palace, officially called Palacio la Moneda, is most commonly referred to as simply La Moneda. Literally translated, La Moneda means “currency,” and La Moneda was used to mint coins from its inauguration in 1805 until 1929. In 1845, it became the presidential palace, both the seat of government and residence and remained the official presidential residence until 1958. Currently, it serves as the presidential government seat. The palace consists of an outer frame of rooms and offices surrounding four inner courtyards. La Moneda is only open to the public once or twice a year, and even at that, the public is only allowed to walk through the inner courtyards. Here are some of the points of interest that you might see if you were permitted inside. 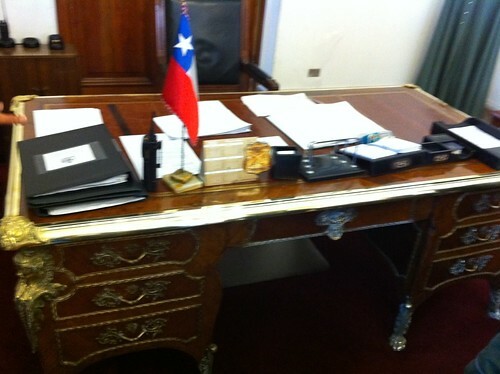 Inside the Palace Guard Commander’s office sits the desk once used by former dictator Augusto Pinochet. The Patio de los Naranjos (or Patio of the Orange Trees) is the largest courtyard in La Moneda and is thus named because of the orange trees growing therein. 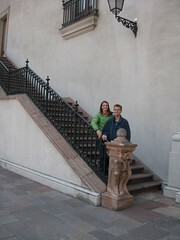 When the Chilean President comes out to talk to the press or a public gathering in the Patio de los Naranjos, he will come down these stairs. 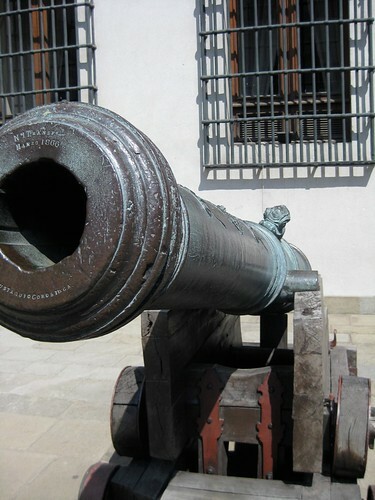 Historic cannons guard the Patio de los Cañones or Patio of the Canons. These colonial cannons named Furioso (Furious) and Tronador (Thunderer) date back to 1771. 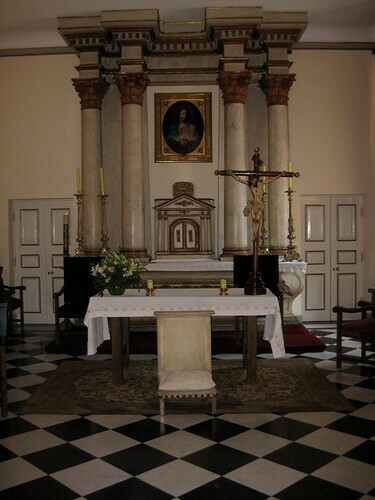 When the Pope John Paul came to Chile in 1987, he knelt and prayed on the white alter seen above. On the second floor of La Moneda, a memorial marks the spot where President Allende’s office was and where he was killed during the 1973 coup. 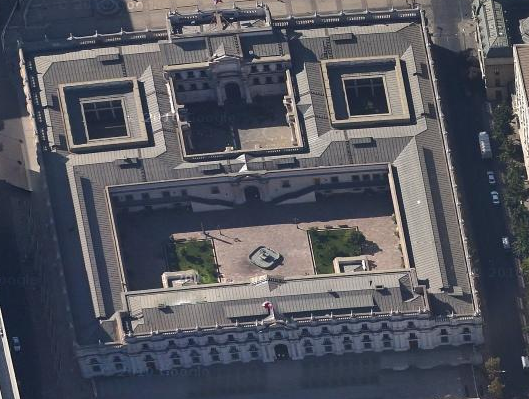 The Chilean Air Force bombed the palace during the coup so in the memorial you can see the exposed bricks showing the original side on the right and the reconstructed side on the left. 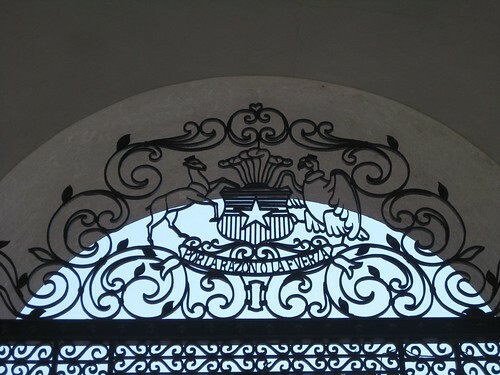 Morandé 80 is the address of a side door on La Moneda through which Chilean presidents traditionally entered the palace to avoid the fanfare of the presidential guard. 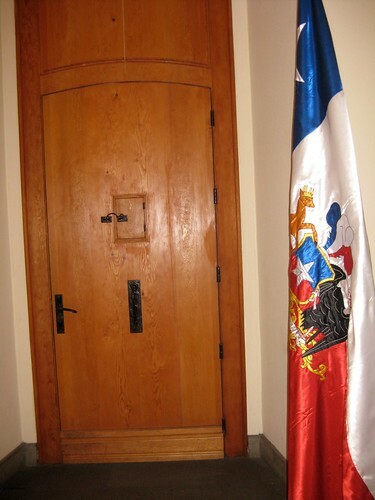 After the coup in 1973, President Allende’s body was removed through this door. It was thereafter sealed during the reconstruction of the building. Thirty years after the coup, the door was rebuilt and it is only used for special occasions. Even if you can’t get a tour inside La Moneda, you should definitely visit this historic building. 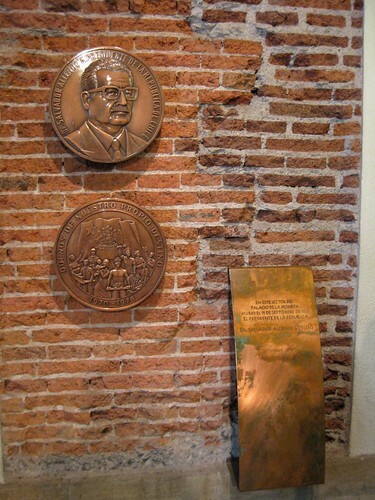 While you are there, you can visit one of Santiago’s most popular museums, the Moneda Cultural Center.